Lately I’ve been noticing a few more “duologies” or two book series in young adult fiction, which I think is a pretty cool idea because it theoretically avoids the “middle book curse” of trilogies where nothing happens in between events getting started and events ending. Today’s Book Whimsy is one such duology is by Sarah Crossan, two post-apocalyptic novels set in world where you have to pay for oxygen. Breathe by Sarah Crossan*: There are a lot of dystopian and post-apocalyptic type novels out there, but one with a good hook will catch my attention every time, and that’s exactly what Breathe by Sarah Crossan has. I had read novels where all kinds of resources are limited, but this was the first one where that resource was oxygen. It is really interesting to think about what that means, such as losing the ability to exercise. However, the science itself behind this premise was definitely not believable and felt almost random at times. Breathe is told from three points-of-view, each of whom have a very different perspective on what it is like to live in world with limited oxygen. While, Alina is part of a underground revolution that is trying to save the environment and create more oxygen, Quinn is a Premium and has never really had to consider what it would be like not to have enough air. Finally, Bea is an Auxiliary, who wants to accomplish things in life, but deals daily with the struggle of lack of oxygen. I thought all three voices were distinct, and although it had a slow start, ultimately the story was entertaining and easy to read. However, the underlying message as well as the plot of Breathe were quite predictable, and so even though the concept was interesting, ultimately in a crowded genre, Crossan’s novel just doesn’t stand out. Resist by Sarah Crossan: The follow up to Breathe is Sarah Crossan’s novel Resist and honestly, even though I was kinda meh over the first book I kinda had to pick this one up anyway–because unless a book is just downright awful, I really hate leaving series unfinished, especially if there are only two books to begin with. Resist picks up right after Breathe, with Alina, Quinn and Bea who must work together to save themselves, and the world. There’s also a fourth new perspective. 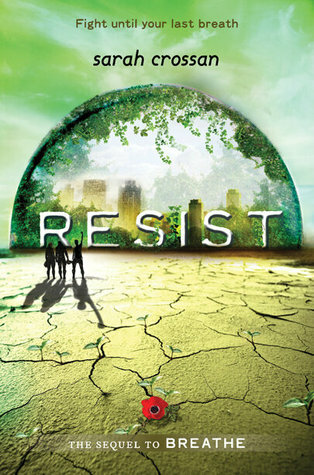 I actually found Resist to be the weaker of the two books and, without offering any spoilers if you haven’t read the first book, there was just some strange stuff going on in this novel and the story itself didn’t feel fully fleshed out. As a result, there were still plenty of questions that didn’t get answered, but at the same time, at this point I don’t really care enough to find out what the answers to them are. 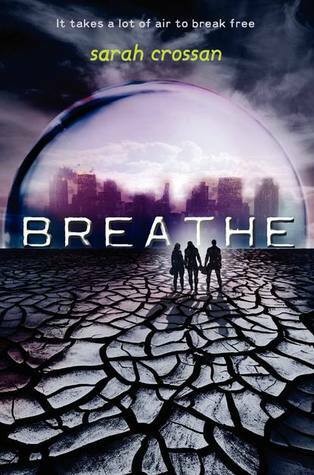 In fact, part of my lack of excitement when reviewing Breathe may have to do with how I ultimately felt about this series when I finished with Resist, especially writing these reviews a couple months late, I definitely don’t find myself wanting to rush back and read these novels again. There are just too many dysoptians out there I like more.